The EE-8 was used throughout WW II and into the Korean conflict. It's an analog telephone that can use either a hand cranked generator for signaling (Local battery) another phone or the operator, or optionally can use the hook switch to signal a central office (Common Battery). In either signaling method there needs to be a couple of "D" batteries in the phone that are connected to the microphone when the Turn To Talk switch is activated on the handset. Unlike military radios, where you can not listen while you are talking, the EE-8 is a full duplex phone just like a Plain Old Telephone System phone, although you do need to use the Press To Talk switch to turn on the talk batteries, and more important when the PTT is released the battery circuit is opened, thus saving the batteries. They were made by Western Electric, Kellogg, Automatic Electric, and perhaps others. Why Batteries needed for Common battery mode? Common Battery (CB) which uses the switch hook for DC signaling and in this phone is what we now call Common Battery Signaling (CBS) where a local battery is still used for the mike talk circuit. would have made the CB operation such that no batteries would be required. This is the way a old Bell System model 500 dial phone worked. And maybe phones for decades prior to that time. Was the EE-8 designed that early or is there some reason why this was not done? There was no concern for operation with the commercial telephone system, just optimum performance in a military field environment. When operating in Local battery mode and using the hand generator, phone to phone, even party lines could be constructed with just a pair of wires. No switch board is needed. 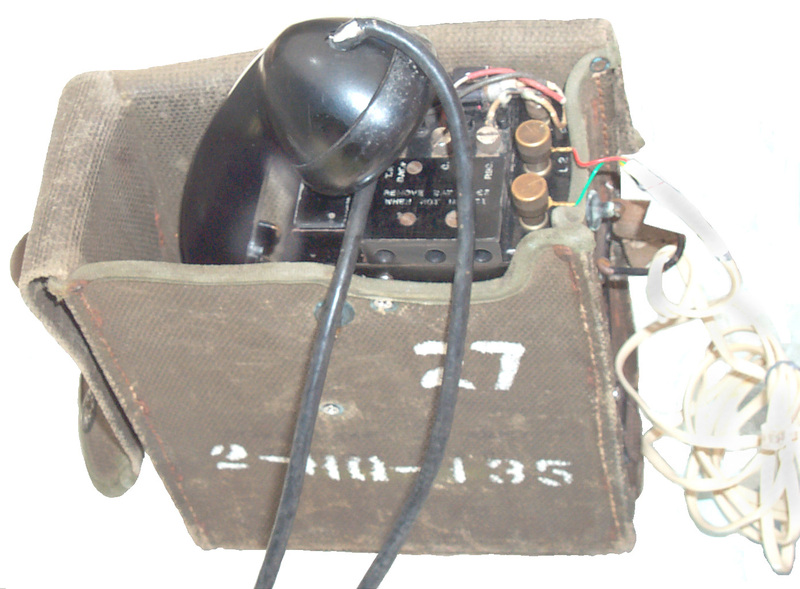 Today the EE-8 is still used in this type of application, such as at a summer camp or as an intercom. But when connected to a switchboard in Local Battery mode the procedure is to "ring" the operator using the hand crank on your phone AND you are supposed to "ring off" to let the operator know you are finished with your call. This allows the operator to unplug your line. But if you don't "ring off" then it's the operator's job to check on your call progress and pull your plug. When a lot of people don't "ring off" the operator's work load goes way up and the capacity of the system goes way down. By using Common Battery signaling the operator is automatically notified that someone has gone off hood and desires to be connected and more importantly automatically notifies the operator that someone has completed their call. All that the operator needs to do is glance along the row or rows of connections and if there is a cord plugged in but without he indicator showing "on hook" then just unplug that cord. So there is a big advantage in using Common Battery signaling. Military field wiring, especially under battle conditions, may be of much poorer quality than commercial wiring. Things like wires laying in the mud with open hand twisted splices can degrade system performance. Under these conditions a local talk battery provides much better communications than the then common practice of using the central office battery to power the carbon microphone. The EE-8 was designed for these conditions. 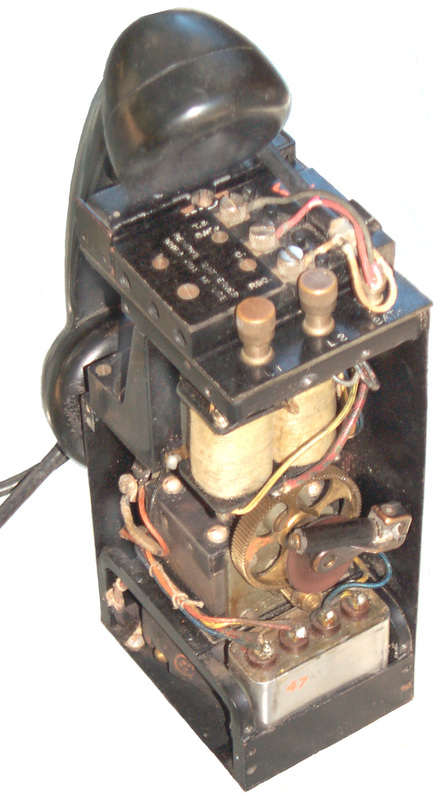 Switchboard BD-91-(*) was used with the EE-8() field phones. It is described in TM 11-336 "Telephone Centrol Office Set TC-12". The 1` 1/2 Ton Truck Loading Plan shows two each chest BC-5 each containing 12 EE-8(*) phones. BUT the BD-91-() boards only work with magneto ringing phones, not CBS phones. The SB-22 switchboard only works with magneto phones. The SB-86/P Switchboard will work with either magneto or common battery signaling phone or all it's lines. My copy of TM 11-4134/TO 31W1-2P-102 is dated Sep 1955 with no revisions and so is far after the end of W.W. II. TM 11-335- Telephone Central Office Set TC-1, 15, April, 1942. "Comprises a complete "transportable telephone exchange or central office for use at any Army HQ which requires one to six BD-80 switchboards." The estimated time for a crew of 12 men to set up this "portable" switchboard was less than 6 hours. It only weighed 7,900 pounds. Each board had a capacity or 30 local battery and 60 common battery lines. TM 11-338- Telephone Central Office Set TC-10, 28, July, 1944. Same basic spec's of the above. Used BD-110 switchboards. First three weighed 7,000 pounds and each additional switchboard weighed 1,330 pounds. "Common Battery Switchboard Circuits"- Enlisted School, Subcourse 214C, Fort Monmouth, N.J., March, 1, 1943. References switchboard BD-89, part of Telephone Central Office Set TC-2. Each BD-89 had 20 local battery (magneto) line circuits and 37 common battery (manual) line circuits. "Signal Corp Unit Beats Ring of Death." It shows a painting by Sessions with the caption "A true incident from the battle at Kasserine Pass." The painting depicts a Signal Corp unit pinned-down in a "hell-hole" and shows them paying-out a reel of WD-110 from the back of a Willys Jeep to a field switchboard (looks like a BD-72) while a lineman is on the remains of a pole among explosions and flames. It also contains a lengthily description of events including- "At about 2100 hours some French soldiers came to us for hand grenades to blow up ;the civilian switchboard they had been operating and to go out with us when we left. "But our Corps Signal Officer told them to put the switchboard out on the sidewalk and that we would pick it up when and if we left." What the above story illustrates, is the high value that the Military placed on any type of communications, captured or otherwise. Since they would also make use of the civilian facilities in occupied areas, it made since to make use of dual-mode phones (not cellular) such as the EE-8 which was capable of local battery or common battery signaling as opposed to having to transport telephones that would work only on one type of system. We also learned, "The fighting heart of every Jeep in the world and the source of its amazing power, speed flexibilty, dependability and fuel economomy is the Jeep "Go-Devil" Engine, which was designed and perfected by Willys-Overland." The EE-8, Type 2, was standardized in 1932, although not procurable until 1937. "Outdoing the maximum transmission range of its predecessor, th EE-5, by at least six miles, it was also lighter in weight and 'talked up much better." In 1939, "American industry's capacity to produce it was fifty a day." Among the antiquated manufacturing processes was the special processing of Kangaroo skins. In 1941, after new methods and materials were developed, the number rose from 50 to more than 2,000 per day. Of course they had to sacrifice quality by eliminating the Kangaroo skin and substituting cowhide. The differences in the versions amount to minor construction variaions and early phones have leather cases and later phones have canvas cases. They all operate in the same way. They all use the TS-9 handset with a Turn-To-Talk switch. case 9 3/8 x 7 1/4 x 3 1/2"
Leather case with cutout above hook switch to allow case to be closed, yet handset can operate hook switch. case 9 9/16 x 7 11/16 x 3 1/2"
I needed to wiggle them quite a bit to get a good connection. since there was some rust n the springs. Remove all handset cord from the canvas or leather case and place the handset, receiver end down into the case with the mouthpiece resting on the hook switch. Plug the cord into your house telephone system. When the phone rings pick up the hand set and hold the Turn To Talk switch as long as you are on the phone. You do not need to release the PTT switch to listen since this is a full duplex phone, not like a radio that's half duplex. When you are finished place the handset back on the hook switch. When the phone rings, pickup the handset and press and hold the TTT switch, converse normally. When finished talking just release the TTT switch and put the handset back into the case. To call the other party, crank the generator then listen for a reply. Be sure to press and hold the PTT switch prior to speaking. I tried a TA-1 and TA-312 and they both worked fine, probably any field phone with a generator to ring the other phone will work. Early MC-131 Ringers were made using steel for both the gong and the clapper. After some time they can become magnatized and the clapper will stick to the gong and will no longer ring. This can be fixed by replacing either one with a brass part. If this can not be done then the clearance between the clapper and gong must be properly set to prevent the clapper getting too close to the gong when stationary. The screws on my EE-8 are badly rusted and can be replaced with stainless steel screws. The 2 screws that go through the generator surround ring are 6-32 x 1/2" Pan heads. The 5 screws that go through the canvas are 6-32 x 7/16" Flat heads. The 8 screws that hold the two covers on the frame are 4-40 x 5/16" Pan heads. This is a 4 wire, unattended, carrier-telephone repeater. Extends the length of 12-channel carrier-telephone systems that use termnals AN/TCC-7 and/or telephone repeaters AN/TCC-8. Each AN/TCC-11 adds 5 3/4 miles. Descrbed in TM 11-2062 (TO 16-40 I 142-5) "Test Set I-142 and Test Set I-142-A (Telephone". Sep 1948. Sound Calibrator TS-550/G to calibrate the sound source. These are covered in TM 11-330 (only2 digits away from the EE-8 manual number of TM 11-333). War Department, 29 Oct 1943, Change 1, Dec. 1944. The BD-71 is a 6 line board weighing 58 lbs. and the BD-72 is a 12 line board weighing 81 lbs. There are 2 lines equiped with repeating coils for each 6 lines on the board to allow easy used for telegraph circuits. The estimated talking range for W-110 field wire is between 14 to 22 miles, depending on if the weather is dry or wet, and if the wire is on the ground or in the air. Although a BD-71 can be added to a BD-72 to form an 18 line board, two BD-72 bboards can not be used toghther because the line cords will not reach far enough. This is the time this page has been accessed since 30 Sep 2001.